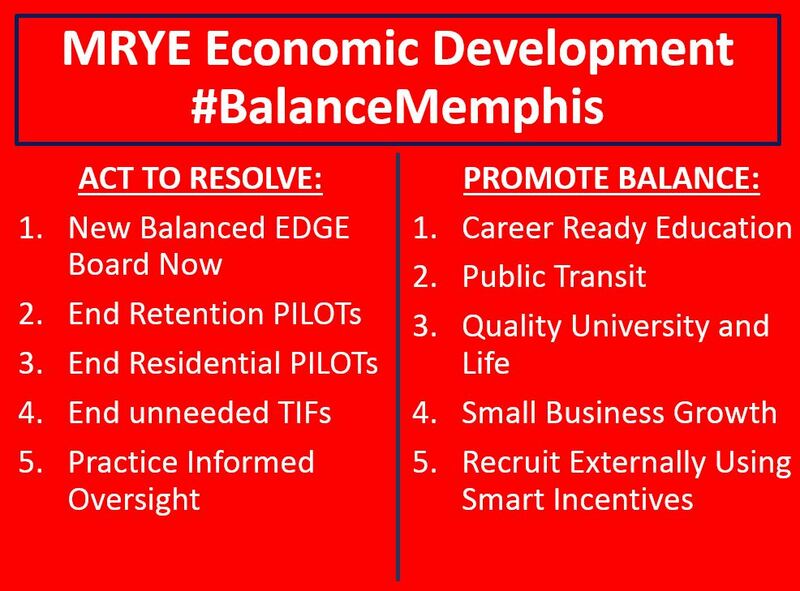 New Balanced EDGE Board Now – Advocates for 7 new Economic Development Growth Engines (EDGE) Board Members to replace the 7 EDGE Board members that have served 7 years due to the lack of a poorly written resolution supported by Memphis Tomorrow that did not provide for checks through term limits for a tax abating board. The current EDGE Board has engaged in practices that justify excessive retention PILOTs to include 1) incomplete accounting resulting in overstated new tax revenue generated, 2) gutting the public record of public comment and 3) poor customer process design. 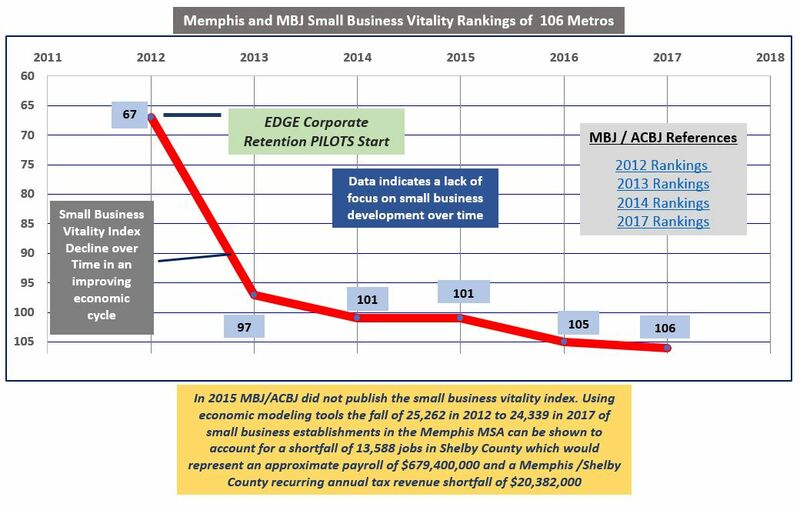 End Retention PILOTs – Ends the practice of payments-in-lieu of taxes (PILOTs) that abates existing taxes for companies to stay in Shelby County and the incomplete accounting that is used to justify overstated tax revenue generated. Based on analysis this practice has cost taxpayers an estimated $281M while forgoing investments in true economic development in safe/paved streets, better workforce and public transit. EDGE reports a grossly unaccounted for and overstated estimated $600M+ gain from the practice. Payments-in-lieu of taxes (PILOTS) are payments instead of full commercial real and personal property taxes due. The payments are typically 75% less than full property taxes due. End Residential PILOTs – These are excessive residential PILOTs for economic development like Broad and Thrive. Shelby County is the only county in the state that engages in this practice and even local real estate developers have questioned the practice especially in a hot housing market. End unneeded TIFs – TIFs stand for tax increment financing and restrict tax proceeds to a specific area. An example of an unneeded TIF would be the Poplar Corridor TIF which is one of the most affluent areas of the City in an unblighted area. TIFs establish a tax base and typically 50-75% of the the increased property taxes that result from the improvement of that property are restricted to be reinvested in the zone defined for improvement area for a period of up to 20 years. While TIFs have some good points in that they result in increased tax revenue, they restrict government in where they can spend taxpayer funds into the future. Practice Informed Oversight – Legislators need to practice informed oversight to protect against waste and excess having to do with grant performance using federal, state and local funds and tax incentives. The State or the Feds are for the most part unable to provide local oversight services. Career Ready Education – Implement a national career education agenda starting with the education to employment connection to support local economic development efforts. Implementation of career ready education is off track and 3 years behind schedule due to deficient Memphis Corporate Community Leadership efforts using taxpayer funding. The problem was most recently documented in the Memphis Business Journal article “Mired in Red Tape”. Deficient education to employment efforts can be shown to cost taxpayers $15M in recurring tax shortfalls per year. Public Transit – Find a solution t0 address deficient public transit which was most recently addressed in a Memphis Business Journal series Redacted. Quality University and Life – These are two points combined from the MRYE survey. Good news in The University of Memphis with FedEx support seems to be on the right track as documented in this Memphis Business Journal article. On the other hand local challenges with a high poverty rate need to be front an center. Small Business Growth – Supporting a reversal in declining small business vitality trends will help address both poverty and local economic development needs. Recruit Externally Using Smart Incentives – Aggressive external recruitment is needed to support competitive population, wage and tax base growth. 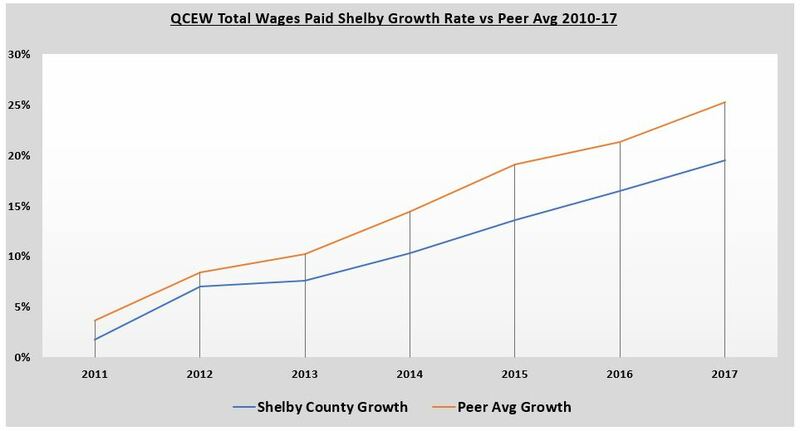 Smart targeted tax incentives should be used to help close the deal of prospective companies to locate to Shelby County while leveraging a customer friendly process.